Lemonade and lunch on the patio one week ago. If it were today we would be wet and needing HOT coffee. and follow her into the flower garden. Remember recently I did a Near Tablescape. This one is it's cousin. Do you see those pale pink poppies just in the background? I planted one last year and now have a hundred and fifty. How's that for multiplication and invasion? 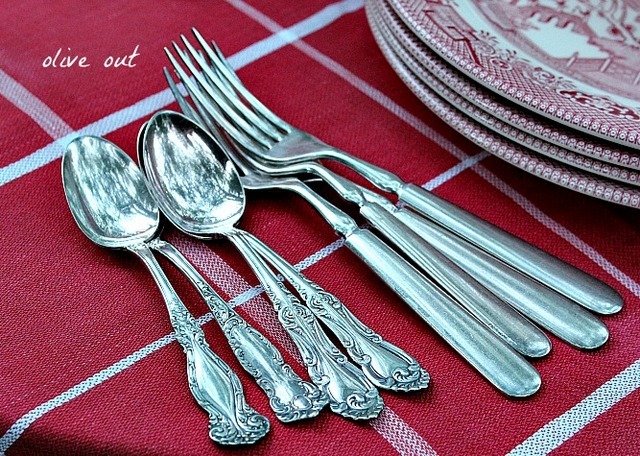 I am using mixed silver plate flatware and Red Willow dishes. I recently found them and could not leave them at a garage sale. I made room for a set of eight blue and red in my pantry. The food is secondary to the classic, and yet scrumptious plates. wrapped each piece and carried them to my Jeep. That was kindness and they were thanked profusely. The pink glasses are so sweet to me and we rarely use them. Another Near Tablescape By Olive and goodness gracious I forgot napkins. My bowls are crooked too. I cannot be trusted with fork or spoon placement. Tomorrow May 15, 2012 Hold Everything Lightly #10 will post. Title and topic yet to be decided. I keep telling myself deadlines breed creativity . Very pretty. Love all those poppies. I love your "near tablescapes"! They are always relaxed and comfortable and oh so pretty! I think your table top is beautiful! Great pieces. Can u come plant a poppy here? I can not get them to grow...drats! Looks like a great table setting and a beautiful spot to enjoy it. Yes, little wet out, but clearing here. you have inspired me..I think I might have to try a near tablescape too...not so good at the whole tablescape thing....but I love to gather and mix and plan.....hmmm. hope Joe is much better.. Thanks for the memories. The forks were my grandmother's table service. All from a big wooden chest. We're down to the last couple of forks now. My grandson is confused by them, putting the silver away, as if it must go with castoffs somewhere else. I tell him "That's grandma's favorite fork," and he puts it in the fork place in the drawer. 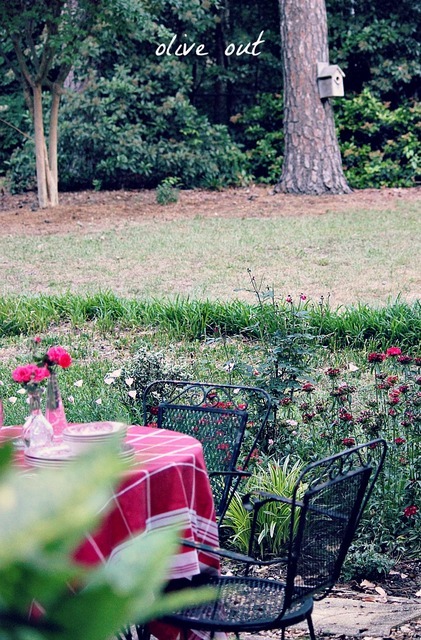 Your garden is such a lovely spot for your outdoor table setting. Love it! 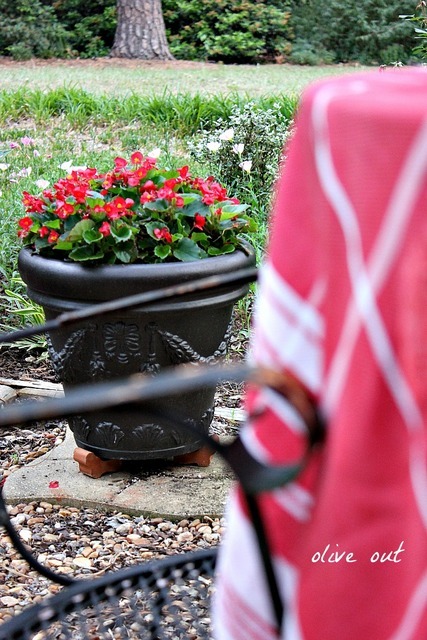 Your table setting and patio are beautiful! What a nice way to enjoy a glass of lemonade! 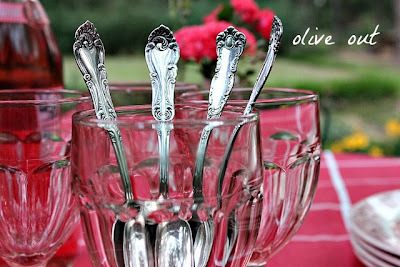 I just love the mixture of silverware, so pretty! A-plus, over the top, pro tablescape. (No "near" about it!) Every single shot is delectable. Who needs food? That first shot is delightful. My kind of tablescape, Olive! It's really lovely. I'm smitten with the poppies, too. Just delightful Olive! Pretty setting and great photos too. Beautiful. Love the red cloth. I have that patio set too. I am loving your beautiful near tablescapes, Olive. Looks good to me. The pale poppies are very pretty too. It's perfect; inviting and elegant. When I read about how far people travel to TJs I geel guilty ~ we have 3 in our town. I'm going to appreciate them more! Your table is beautiful. I love the colors. I would be happy to come and have lemonade there with you. I'll be over with the fake champagne and strawberries and we'll give those pink glasses a workout! I just pinned your table, by the way. What a happy table, Olive, and now you've got me craving that lemonade. I really do need to make a trip to Trader Joe's - only 30 miles for me. Hi Olive! Near...my foot! Honey, you've nailed it. Your table looks so pretty all set up out doors! I love the red willow and have some myself. The pink lemonade looks perfect! Beautiful table!! I love your tablecloth and I certainly would have grabbed up those dishes as well, what a great deal! Those pink glasses are so pretty. This is adorable!!! I am smitten with your pink stemware!! !I do believe that everytime I photograph the flatware on my tables...they adjust themselves! Always, always, mine are Crooked!!! 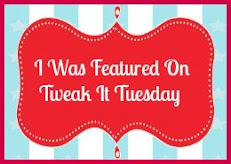 Just goes to show my chosen blog title is so~o~o fitting! Ha! Thanks for stopping in with your sweet visit and comment! P.S. Visiting from Table Top Tuesday! I love how the red tones pop against the greenery. It all looks fantastic. The color alone and everything else makes it such a pretty table. Very pretty. LOL at the poppies, Olive! Probably something you least expected. Isn't that always the way? I LOVE those dishes! What a score! They are beautiful and I love your tablescape. The glasses are great, too. No expert here, but I would say you NAILED the tablescape. I love the tablecloth!!! Can't wait for the next one! Very pretty and I love that color!!! Such a pretty table...and a great place to eat outside!! Wonderful colors!! Have a great day!! How lovely, Olive! I'd love to join you at that table! Wonderful finds, too! I thought the crooked bowls were charming! Your setting looks "real"! 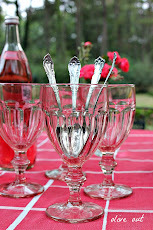 That tablecloth is such a great color and I have a "thing" for pink glassware, so I love yours! I'm in heaven here at your table. The multiplying flowers in the background make it perfect. I found your post at Savvy Southern Style's link party. How lovely...especially the beautiful tablecloth! Enjoy your week! 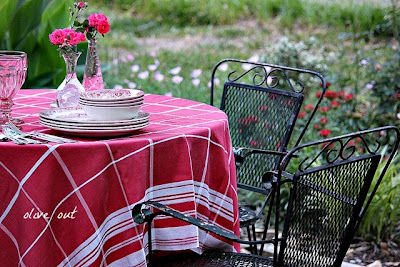 I just love your red tablecloth and your red transferware together! I would feel so comfortable having lemonade and lunch at your table. I can never find anything at garage sales. You really scored here. Your whole set up is very pretty and I love the colors. You are a lucky woman to have all those beautiful poppies! I have a similar story...I planted a few forget-me-not plants, and I think I have 200 this year. I love your cheery table that is filled with lovely bargain pieces. Visiting from Let's Dish. Have a nice week! What a pretty setting! 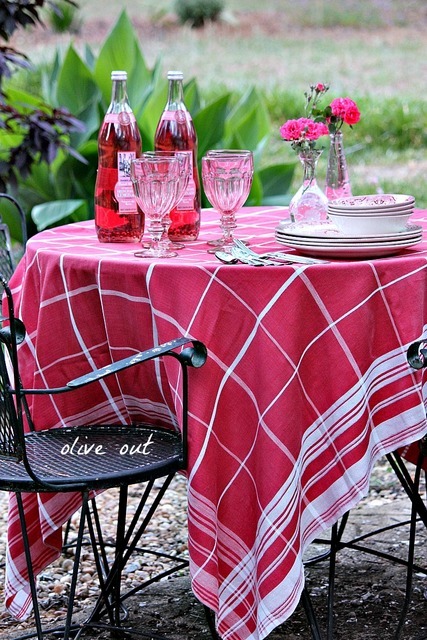 love your tablecloth and pink stemware. OK, let's go back to this thing about the pink poppies. Seriously? You planated just one and they have multiplied that quickly and profusely? I NEED some of those!!! What kind are they??? I love poppies for arrangements, but I have never attempted to grow any. I am probably as gardening challenged as they come! :-) Your tablescape is lovely. Even if the dishes aren't all laid out and the napkins are missing, it still counts as a tablescape! I'm totally in love with those pink glasses!!! Are you sensing a pattern here? Love the pink poppies, pink glasses....!!! Well done! I bought one of those pink flowers late last summer and this spring they have taken over. I thought, initially, they were weeds until they bloomed. I do not remember the name of them and I just started a garden journal. I love your bargains! Oh how I wish I had some red willow...what a deal!!! Well Olive, I don't know what you are talking about when you say your don't know how to tablescape! This is lovely, happy and inviting! What could be better? Beautifully put together. "Near tablescape?" Looks like the real thing to me! Who says you don't know how to tablescape? This is great! It looks so relaxed and just thrown together when clearly it wasn't. 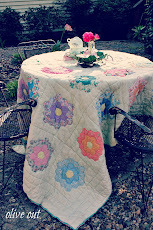 Very pretty outdoors table! You did a great job. I do plain and simple tablescapes, but love to see the big time tablescaping artists, don't you? Olive, I don't know what you are talking about! You are a terrific tablescaper. 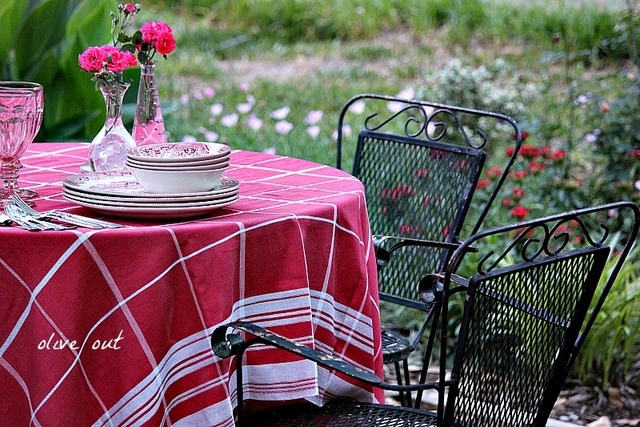 I adore that red and white table cloth and all the red details of this tabletop. Simple is always a great approach. Kudos! Love your beautiful table! 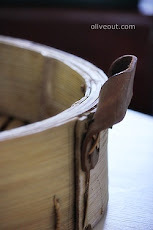 A tipped bowl or crooked piece of silverware makes a table "real" and all the more endearing. Visiting from Let's Dish,& now following you. oooh, I hope the poppies we planted spread.... fingers crossed. Visiting from Let's Dish this week. Lovely setting for lunch. And what a bargain for those dishes! Olive, do you know the name of the pink poppies in the background? They look like they would go great with the wildflower called pink primroses in Texas. The table is beautiful! Do you put upholstered chairs in your hedge? Do Praying Mary's Find Me?